Education Doctor of Physical Therapy in 2011, University of Connecticut Bachelor of Science in Exercise Science and Human Performance, Southern Connecticut State University Certifications Board Certified Orthopaedic Specialist Graston Technique® Trigger Point Dry Needling Clinical Specialties Manual therapy and sports-related injuries Organization Memberships American Physical Therapy Association Outside of the clinic… When Bryan is not in the office, he enjoys hiking and kayaking. He also enjoys spending time with his family and friends. His favorite foods: baked goods. Education Doctor of Physical Therapy in 2018, University of Hartford Bachelor of Health Science in 2015, University of Hartford Clinical Interests Colleen is working towards a certification in Trigger Point Dry Needling and is also looking forward to advancing her manual treatment techniques. She has a particular interest in rehabilitation for individuals suffering from neurological issues. Outside of the clinic… Colleen loves to spend time outside, staying active through hiking, kayaking and yoga. She also has a passion for traveling and is always up for a new adventure! When at home, Colleen values being able to spend quality time with her friends and family in Connecticut. Education Doctor of Physical Therapy in 2016, University of Hartford Bachelor of Science in Health Sciences in 2013, University of Hartford Sacred Heart University Orthopedic Residency Program Clinical Interests Josh is planning to become a Board Certified Orthopedic Specialist in the near future. 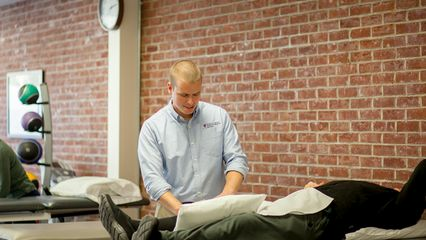 He is also planning to become certified in the Graston Technique and advance his knowledge for management of general musculoskeletal pathologies. Outside of the clinic… Josh enjoys spending time with his family. He is also an avid sports fan, especially the New York Rangers, but also really like baseball and football.